While I think all art should be open to a variety of interpretations, I shall tell you what I was thinking when I proposed the concept for this video to my collaborator, Gene Panczenko. I wanted to show that people often set a goal for themselves, and when they have achieved that goal, they are not really satisfied. Thus, the character that I play in this video continues to “win” the game she is playing — after all, she is only competing with herself — but her satisfaction with her accomplishment diminishes over time. This video was one of the first works that Gene and I created together. He was very pleased with my performance, and I was very pleased with his camera work! 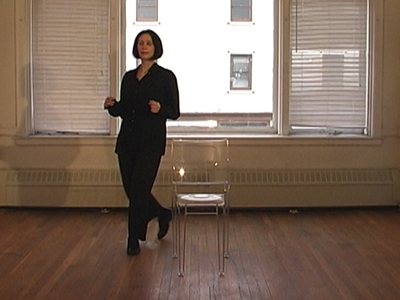 Additionally, we were both pleased that Janet Koplos selected this video for an exhibition at SoHo 20 in Chelsea.